Proslat's Heavy Duty ProRack is a multi-tasking wall mount storage shelf - designed to provide maximum storage without loss of floor space in your garage. Our patent-pending design delivers functional storage for bulky items on top, the flexibility to hang items below and the ability to see what's on the shelf through the grid. With the steel grid shelf you can see what's sitting on top and hang more frequently used items below. The 12-inch configuration of the ProRack is ideal for bulky items such as kayaks & storage totes and offers sufficient storage for bikes, golf bags, and more. The Proslat ProRack is modular - you can start with a 4-inch , 8-inch or 12-inch system and add more as needed. Ships in 3 cartons. Each 4-inch span will support up to 800 lbs. when mounted as recommended to studs. Optional Proslat panel bracket available upon request at no charge. Mounts directly to your wall or use with Proslat wall panels. If you wish to use your rack with a Proslat panel system, we will be happy to include (at no charge) a Proslat panel bracket - simply email us your order number - info@proslat.com or phone 1.888.691.2944. Create visible, accessible storage space instantly with this Honey-Can-Do 4-Shelf Steel Shelving unit featured in a chrome finish. Its 54-inch steel frame make this unit the perfect blend of style and functionality. Durable enough for the mudroom, garage or commercial kitchen, this NSF-rated shelving is also ideal for food equipment areas including refrigerators, freezers, and ware washing areas, and is capable of withstanding up to 250 lbs. per shelf. Adjustable shelves and stackable components allow you to change the configuration as your storage needs evolve. Combine multiple units to create a customized storage wall. The no-tool assembly allows you to construct in minutes a shelving unit that will last for years. NSF urban shelving 4-tier adjustable storage shelving unit, white. Create visible, accessible storage space instantly with Honey-Can-Do industrial shelving systems. White powder coat finish and 54-inch steel frame make this unit the perfect blend of style and functionality. Durable enough for the mudroom, garage, or commercial kitchen; this NSF-rated shelving for food equipment areas including refrigerators, freezers, and ware washing areas is capable of withstanding up to 250 lbs. per shelf. Adjustable shelves and stackable components allow you to change the configuration as your storage needs evolve. Combine multiple units to create a customized storage wall. The no-tool assembly allows you to construct in minutes a shelving unit that will last for years. Size: 54-inch H x 36-inch W x 14-inch D Colour: white assembly required. With stringent quality control methods, Honey-Can-Do confidently offers a limited lifetime warranty on every product they make. Peace of Mind. 28-inch H x 12 ft. W x 28-inch D ProRack Steel Shelf Proslat's Heavy Duty ProRack is a multi-tasking wall mount storage shelf - designed to provide maximum storage without loss of floor space in your garage. Our patent-pending design delivers functional storage for bulky items on top, the flexibility to hang items below and the ability to see what's on the shelf through the grid. With the steel grid shelf you can see what's sitting on top and hang more frequently used items below. The 12-inch configuration of the ProRack is ideal for bulky items such as kayaks & storage totes and offers sufficient storage for bikes, golf bags, and more. The Proslat ProRack is modular - you can start with a 4-inch , 8-inch or 12-inch system and add more as needed. Ships in 3 cartons. Each 4-inch span will support up to 800 lbs. when mounted as recommended to studs. Optional Proslat panel bracket available upon request at no charge. 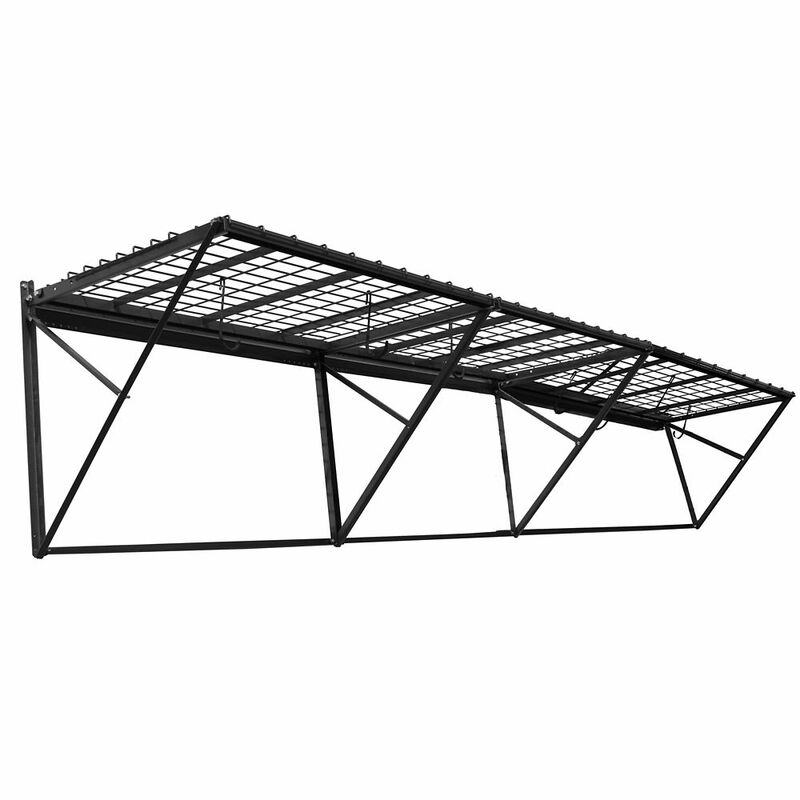 28-inch H x 12 ft. W x 28-inch D ProRack Steel Shelf is rated 4.5 out of 5 by 4. Rated 4 out of 5 by Michael from Good sturdy shelves. Instructions not clear.... Good sturdy shelves. Instructions not clear. Rated 5 out of 5 by Joe from Great fit & finish. Easy to assemble. Good sturdy quality materials and design. Spend the extra m... Great fit & finish. Easy to assemble. Good sturdy quality materials and design. Spend the extra money and get the better item like this one. Rated 4 out of 5 by Dave from Looks very professional when complete! The quality of materials used for these shelves very good. If you are just installing one four foot section it is pretty straight forward, but when attaching more sections to make it 12 continuous feet its a challenge. When the sections are connected they share the same main bracket on wall and there is very little room to attach the bolts that support the other brackets. The instructions are limited and when they show a detailed corner connection where several brackets overlap it is all washed out in the picture. You can not tell which bracket overlaps the other. Just have to use an educated guess and look at pictures on-line or on the box it comes in. If you are thinking of adding the tire rack option, do it at the same time you are installing the main shelves. If you do it later you will have to unload the shelves or support with jack posts to carry the load. Rated 5 out of 5 by Duke from Not inexpensive, but this turned out to be sturdy shelving/bike racks which we needed for our ove... Not inexpensive, but this turned out to be sturdy shelving/bike racks which we needed for our overstuffed garage. Purchased 3 (12 feet) and found it easy to install. Exceeded expectations.